My third cruise was aboard the Voyager of the Seas in January 2002. Coming a few months after 9/11 there were a variety of points where this cruise stood out. I selected Voyager of the Seas in part because she was historic, like Sovereign of the Seas had been For this cruise I choose to drive to the port again. The Voyager of the Seas and all but a few ships that followed her among Royal Caribbean’s fleet, were of a size unthinkable even a few years earlier. At 137,000 GRT she was larger than any cruise ship in history with a list of innovations too long to give justice too in a simple review. An indoor ice rink, rock climbing walls, massive three deck dining room, massive interior promenade with three decks of cabins overlooking it and the simple raw size and passenger count were unprecedented. Though it was my intent to do so before the events of 9/11, I drove to Port Miami again for this cruise. Rather than driving from Tampa however I staid at a hotel near the waterfront of downtown Miami. 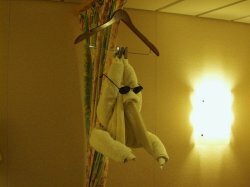 That will prove the topic of a hotel review here at Cruise Aficionados but suffice to say the experience was mixed. Never the less the short drive ensured I was able to arrive at Port Miami at 9 a.m. and I had no issues checking my bags after parking my car. The embarkation process was actually smoother, although increased security meant I was not able to enter the terminal until 10 a.m. Wedding parties boarded first, but my early arrival meant I essentially followed them up the gangway. Although the boarding process had improved even from the year before, the extra scrutiny foreign nationals experienced slowed the process down some. Likewise the events of 9/11 had sharply depressed the market for cruises, meaning a great many people were folks taking advantage of unprecedented discounts to cruise for the first time. Once onboard the usual tour, dining arrangements, and exploration was the order of the day. Voyager and her sister, the Explorer of the Seas were cut from essentially the exact same design, both having been completed in order, at the same ship yard in Finland. Coming fully two years after her entry into revenue service the Voyager had worn well having been the focal point of the cruise media and public eye for that time. On this cruise I choose a balcony stateroom for the first time. The balcony itself was compact but featured a simple table and two short deck chairs. The dividers that shelter you from the view of your neighbors were frosted glass and not fully able to obscure you from sight for my liking. The sliding door to the stateroom however was able to seal the sounds of the port and most of the activity in nearby balconies to my satisfaction. The room itself was akin to most any basic stateroom on Royal Caribbean among the Voyager class or newer ships. Like the ships decor at large, the colors are pleasant, easy on the eyes and tasteful. The beds could divide into singles or combine to form a queen. Done properly there is not a gap of any note in the center of the main bed. The bathrooms are serviceable though not large. One does not usually cruise for the quality of time spent in a bathroom anyway. There were enough outlets for the early generation of electronics I toted with me. The main dining room was a more richly colored space than that of the Explorer of the Seas. The wait staff would trump even the great group I enjoyed the service of previously and as denotes a finely tuned team, my habits and choice of drinks were well anticipated on my arrival each night. The ship departed Miami just behind the legendary Norway. Unusually a Carnival ship was stuck waiting for Voyager to pass. It seems a passenger attempted to board with “theraputic bees” in a jar. This resulted in a security calamity that delayed her departure for hours. The departure was a highlight as it often is, the amazing views of Miami, Key Biscayne, and the “elephant walk” of cruise ships moving out of Government Cut to open ocean. This time and for every cruise since, a small coast guard patrol boat sailed in close formation with Voyager as she left port. The ships stores were the standard fare of logo goods, sundries and premium goods. The dance club, casino and public spaces were many and usually open for the use. The trademark Viking Crown Lounge became a favorite spot to visit. The best view onboard the ship combined with the typically uncrowded and relaxed atmosphere to provide a refuge from the activity elsewhere. Entertainment was excellent overall though the shows aboard Voyager suffered from being rather dated at the time. Two years after her launch the main-stage and ice shows were still vintage 2000 alluding to her status as the biggest and first of her kind. At the time of sailing on her there were then three of her class in operation so some of the references felt awkward. The ice show suffered from both glitches and practical jokes in the form of “instant replays” of a mock competition of skaters having a half dozen “stubs” from previous shows. In once case, a clearly unintentional fall was revealed to be a common mistake when a clip of the same skatter falling from a previous how-complete with a different costume, was played for the “instant replay.” The sour glare from the skater told you more than words the crew was having an inside-joke at his expense. Regardless the shows were entertaining. The ice rink was well used for unscripted shows run by the cruise director and for dancing on several nights. Overall this cruise ranked slightly behind Explorer of the Seas in the previous year. The entertainment seemed a bit worn around the edges. The crew seemed exhausted and struggled at times to keep pace with cleaning public spaces. And there seemed to be difficulty in keeping things like the rock climbing wall, in-line skating, and other highly publicized parts of the ship open for business. Even the all-night snacks were closing at inexplicably early hours. This didn’t last on later cruises but it was discouraging. Likewise, if the dining staff was among the best we had, the quality of the food seemed to decline for the first time in three cruises with Royal Caribbean. It would rebound but it was disconcerting to experience the change in quality. Voyager of the Seas visited Ocho Rios, Labadee, Cozumel and Grand Caymen on this cruise. As with the year before I didn’t find any excursions that appealed enough to buy. Disembarking at Orcho Rios I spent some time at a few duty-free stores before walking toward the official taxi stand. This consisted of a traffic roundabout the middle of which had become the only space taxi drivers were allowed to solicit business for people exiting the docks. This was due to complaints from passengers feeling accosted by drivers pushing for business. While being contained in a compact space, when I stepped foot outside of the main gate of the dock, nothing short of a roar broke-out as several dozen taxi drivers began shout at the top of their lungs waving pamphlets and arms to gain my attention. That singular moment was enough to turn me around and I sought a footpath to the shopping area on the other side of the small bay which hosted the cruise dock. However a motley assortment of men wearing a hodge podge of “security” badges and hats, pointing people to any number of alley ways leading to the beach killed any interest in bothering with shopping at this point. So I returned to the ship and enjoyed the day there. Labadee was little changed from the year before, however I declined to tender into the port this time. The good weather had siphoned off virtually everybody from the ship and it was so pleasant aboard I saw the ice show and otherwise kept to myself. Grand Caymen was a great port to visit. A fleet of five other ships were in port that day and all require tenders for passengers to visit the port itself. Many excursions leave directly from the ship itself I noticed. The port is a British territory though you will find a large American ex-patriot community in the shops. In most respects it felt like visiting a shore-side town in Florida more than an island in the middle of the Caribbean sea. Cozumel Mexico was a great port with duty free shopping immediately off the docks and quick taxi service into the main shopping district. Curiously, despite the line having official drop-off points, the taxi driver dropped me at an alternative location which I suspect he received a kick-back for. I knew it was not the agreed upon location but knowing in detail where I was I had no objections. The shopping in Cozumel is plentiful and well kept. I started near to the far end of the shopping and walked back toward the ship. Ironically I didn’t buy the two things I jokingly said I would, a chess set and a cheap Mexican blanket. Disembarkation suffered from passengers being stuck out of the rooms and jamming themselves in every nook of the ship. The process at the time had not yet been refined to avoid the kind of jarring experience which could spoil a week of bliss onboard a cruise ship.